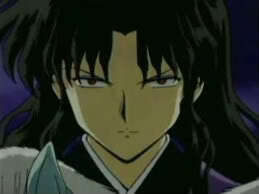 Bio: The main antagonist, Naraku literally means "underworld", or "hell" and is responsible for nearly every character’s suffering throughout the series. He is a half demon that originated from a bandit named Onigumo. Unlike Inuyasha, he can choose the time of the month when he becomes his weak human form. Like Inuyasha, Naraku's main goal is to collect all of the shards of the Shikon no Tama in order to become a full demon. He had feelings for Kikyo because of Onigumo's love for her while he was alive. Later, he expels his human heart and with it his feelings for Kikyo and his human half, making him a full demon.